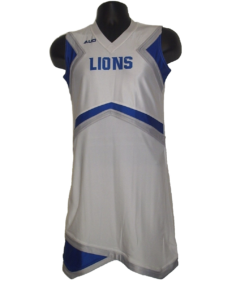 Our Sublimated one piece cheer dress can be made in sleeveless or long sleeve. This custom sublimated cheer uniform is the perfect choice for younger teams. Made with quality 2-way stretch poly/spandex fabric, your squad will look great cheering for their team.